Suffolk Naturalist: Little munchkins and their instars! Well, so far no-one's been able to ID the cricket from last weeks blog, which is a shame, because I have no idea either! I've looked and searched everywhere, but to no avail. So maybe it will remain one of my life's mysteries! Now, cast your mind back some weeks to when my neighbour found an Emperor moth on her back door, and when I got home, I found it'd laid some eggs. I was going to be away when they hatched, but my good friend and county moth recorder, Tony Pritchard agreed to look after them for me. Needless to say, when I got back, Tony had a tub full of about 75 caterpillars about 4mm long munching on bramble leaves. It's important to point out here, that caterpillars don't just eat any leaf put in front of it, oh no. Their fussy you see. Each moth is reliant on a particular 'food plant' and will only lay its eggs on one of those food plants (usually). Luckily for me, emperor's have quite a wide range of food plants they like including bramble, apple and heather. Thankfully these plants are easily obtainable, so rearing them shouldn't be too difficult. Saying that, my emperor moth found itself in temporary captivity and needed to lay its eggs, so done it whilst in the box. However, maybe this was fate because as I'm now rearing the caterpillars to maturity for release on my local heathland, the chances that more will survive has increased. Now I know some may say that it's interfering, but when it comes to moths, being a truck driver I know that I find many a moth splattered on the front of my truck in the morning. Now if you consider the amount of trucks on the road and how many moths get splattered by these trucks (and other vehicles come to think of it), then that's a lot of moths that are taken out of the equation. So maybe I'm helping to balance that equation by making sure some of them make it through to maturity. So what do these little fellows look like I hear you ask. Well here's a picture of one when I got back. A newly hatched Emperor moth caterpillar. As you can see, they're tiny. But they don't stay this way for too long and before you know it, they'll be quite a size. Some of you may not know what I'm on about here when I talk about 'instars' and that's a good thing because I'm about to explain it to you in a very simple way. Female emperor moth Saturnia pavonia on wifey's hand. Then compare that to the newly hatched caterpillar pictured previously, that caterpillar's got a long way to go. So each time the larvae sheds its skin, it's called an instar. So a larvae that has shed its skin (known as an 'exoskeleton') twice is on its third instar, this is where my little munchkins are at. Already at 3rd instar and looking a bit chunky! Here's another insect which has just gone through its final instar to change into an adult. It's a damselfly which freshly emerged from my pond today. 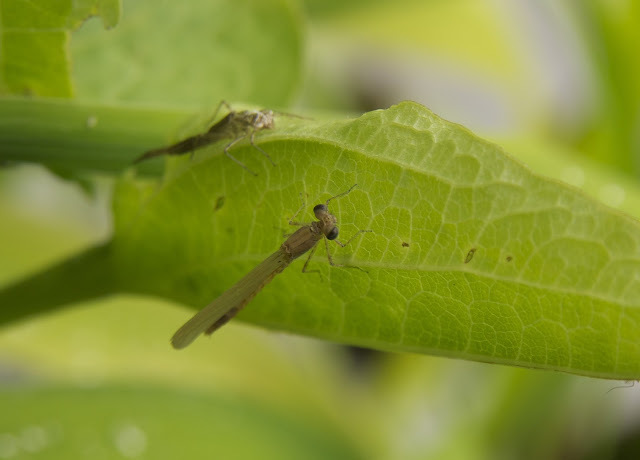 The old exoskeleton can be seen on the leaf edge whilst the newly emerged damselfly takes cover beneath the leaf. It does this for two reasons. 1. The exoskeleton is just that, an outside skeleton. Unlike us who have our skeletons on the inside, insects have theirs on the outside and during this change, the exoskeleton is very soft making the insect vulnerable to predation. The second reason is its wings. They are very soft and damp and like a newly emerged butterfly, they need time to dry off and stiffen to become of any use. Newly emerged damselfly going through the final instar. I hope that you have a small understanding of instars now and will know what I'm talking about should I mention them in future, pay attention, I may be asking questions!!! Now, back to my little munchkins. I currently have them housed in a small glass fish tank, but soon, they'll need to move to bigger premises. I'm feeding them on a mix of bramble and apple leaves at the moment, but I'm phasing out the brambles in favour of apple for three reasons. 1. The bramble behind my garden is no longer in reach. 2. I'm getting fed up of being pricked by vicious bramble stems. 3. The apple leaves are much easier and safer for me to obtain as I have an apple tree in my garden! However, when they start to reach their final instars, I'll get them onto heather as that's the main food plant of where I'll be releasing them. I usually pick about 6 stems of food plant and stick them into soaked oasis blocks, which you can obtain from most florists for about £1 a block. This keeps the leaves fresher for longer and I don't have to replace the stems for 2-3 days. Each time I change the stems I also give the tank a bit of a clean out. 70+ caterpillars create a lot of 'frass', otherwise known as caterpillar poo! It's important to do this to stop any infections or fungus' developing in the tank which will in turn kill your precious munchers. Yes, and with it come the various insects and wildlife. I had the moth trap out last week and caught my first micro moths of the season as well as my first hawkmoths, a Poplar Laothoe populi and a Privet Hawkmoth Sphinx ligustri made me a very happy man indeed. 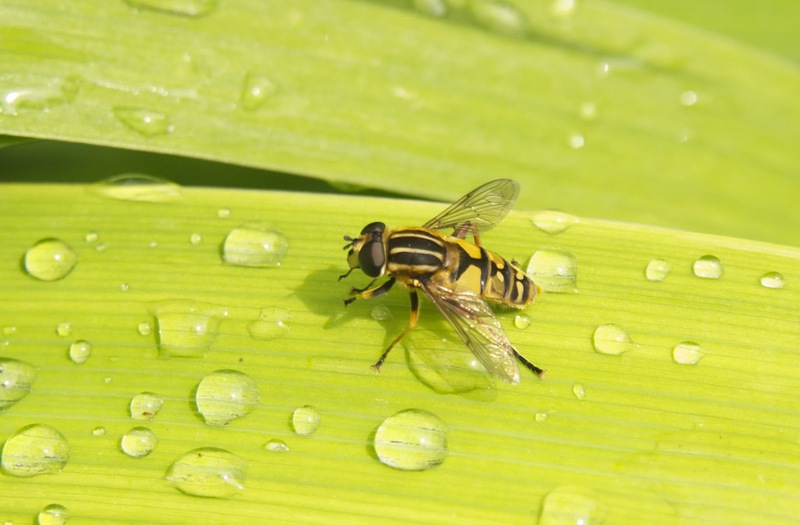 Another favourite of mine that is beginning to show are hoverflies. I like these harmless little fellows and I hope to be able to show you their diversity as the season progresses. I think there's about 260+ different species of hoverfly in the UK and I recently purchased a new book which I reviewed here some weeks back. It's got a wonderful 'key' in it, which helps you identify the various species. Some of you might be thinking what's he going on about when he says 'key', but I'll cover that in another blogpost in the future. Something to look forward too! Helophilus pendulus A male Hoverfly soaks up the sun on my pond. I also seem to have a bee hive under the waterfall (or water trickle) by my pond. One day whilst feeding the fish, I noticed a small buff-tail bumblebee whizz past my ear and straight down to the back of the waterfall and fly down behind a rock. Some years back, when I was making the pond bigger and had to move the waterfall, I unknowingly disturbed a hive of buff-tails, who informed me, not by stinging me, but by head butting me! I soon realised what I had done and a quick call to the Suffolk Beekeepers Association helped tremendously. They told me to dig the hive out on a spade and place it under a hedge. I done this and placed a terracotta pot over it leaving a small gap for the bees to enter and exit through. They stayed there for the rest of they year not much worse for their ordeal. Well, it seems they're back again and obviously building their hive in the mouse nest which I've always had under my waterfall. A testament (thankfully) at how rubbish my cat is when it comes to hunting! Talking of bees, since we moved to this house, we've had a bush outside our front window. It's nothing much, not very flowery and an evergreen. Yet this past two weeks it's been covered with an average of 50+ bumblers busy doing their thing (collecting nectar) for their hive (maybe the one in the back garden). The bush is audible humming at times, so busy are they. Another first for my garden is a solitary bee that's decided to use my bug hotel which has been hanging up for the past 3 years with no action. Two of the blocked up bamboo stems show where the bee has laid its offspring. 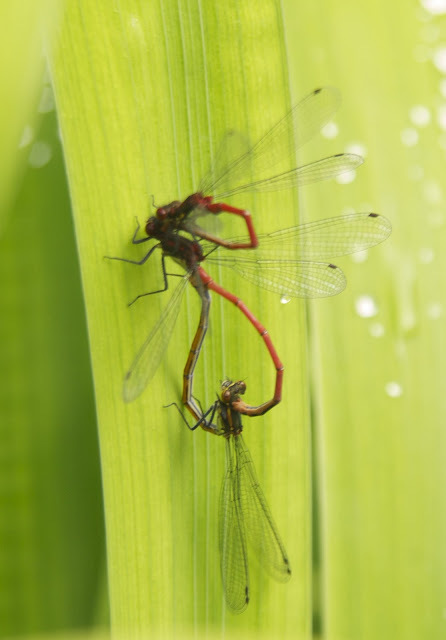 Just one more picture to leave you with that I also caught on the pond this morning and that was of two mating red Damselflies and a jealous male who was trying to get in on the action. off. Buzz off mate and get your own!!! Just before I sign off, I would like to welcome my latest follower Bill Grant. Glad to have you aboard, you obviously like my blog and I hope you continue to do so. Till next time, be happy and keep safe.